Easing back in to posting, after settling in to Providence. This is simply an Aviation variant, with St.-Germain in place of the creme de violette. We sipped this in front of the television while watching Frank Sinatra: A Man and His Music, part of TCM‘s Sinatrafest. Dunno how summer’s treating you where you are. Here in BKLN NYC, the weather’s been unpredictable all summer. Be that as it may, here’s a great drink for your Labor Day weekend. I’m calling this the Flying Cucumber because of its obvious origins in the Aviation. The Martin Miller’s is good for this because it has definite cuke notes, but Hendrick’s would probably work well, too. Here’s a piccy of it; the recipe’s after the jump. Shake over ice and fine strain into a chilled cocktail glass. 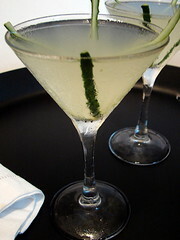 Garnish with cucumber slices or strips of peel. I don’t know how many variants there are on the French 75, but they all seem to take a name that involves fiddling with the number: French 75, French 74, French 76, et cetera. This weekend’s drink is no exception. I started with the beautiful bottle of St-Germain elderflower liqueur that Jen bought me on Friday. Because we commemorate our Friday wedding every week with a tradition we call Fizzy Friday, I wanted a drink with champagne. Luckily, a French 77 was among the drinks listed in the cute little booklet that hangs from the neck of the St-Germain bottle. This wasn’t quite what I had in mind, though, mainly because I wanted some gin. I also didn’t want to chill the glassware. Although I’ve no problem chucking cocktail glasses into the freezer, my champagne flutes are a little fragile and I’m more than a little clumsy. Filling glasses with ice water never quite gets them cold enough for my tastes. This would be a tasty drink on its own. And, oh yeah, it already is a tasty drink on its own. Technique: Shake over cracked ice and fine-strain into a champagne flute. Top with champagne. In this formulation, the St-Germain is perhaps too subtle. I mixed again with a bit more of the liqueur but didn’t take note of the proportions. Equal amounts of lemon and liqueur would work best for this, I think, especially since the lemon and elderflower meld so well. Be sure to read Anita and Cameron’s post on Le Bourget to see their thoughts on the lemon/elderflower marriage. 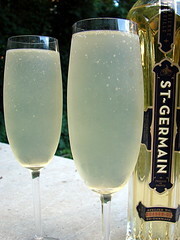 Also, if you’ve not seen the lovely St-Germain bottle, check their photoset for this drink.